I’m Director of the School of Interactive Arts and Technology at Simon Fraser University in Vancouver, Canada. I am also an Associate Professor and the Director of the Connections Lab (cLab) research group. My research is in the areas of Human-Computer Interaction, Interaction Design, and Computer Supported Cooperative Work where I study social culture, user behaviors, group collaboration, and ubiquitous and mobile technology design. This has involved studying, designing, and evaluating a range of technologies including communication, coordination, and gaming systems. My work tends to span many disciplines including computer science, social psychology, sociology, and cultural anthropology. Many people misspell my first name: Carmen: a song (Latin); not my name. Carman: lord of the castle (Celtic); my name. Domestic Computing: technologies to support family routines, communication, coordination, and connectedness, including video communication systems (e.g., Skype), family calendars, messaging systems, and social media. Telepresence: the design and use of video-mediated communication technologies to connect people over distance, including telepresence robots at academic conferences, telemedicine for remote patient consultation, human proxies for university classroom attendance, shared outdoor leisure activities, and mobile video streaming. Mobile Computing: the design and use of mobile devices (smartphones, tablets, smart watches) inside and outside the home, including the potential overuse of mobile phones, mobile payments and mobile commerce, mobile photo capture and sharing, and mobile device usage in developing countries. Pervasive Games & Escape Rooms: the design and play of pervasive and location-based games, such as geocaching, photo-based treasure hunts, and alternate reality games, and collaboration in escape rooms. Conducting research and technology design for domestic life is by no means easy. Methods commonly used in the field of Human-Computer Interaction in settings like the workplace may not easily translate to the richness and complexity of domestic life. 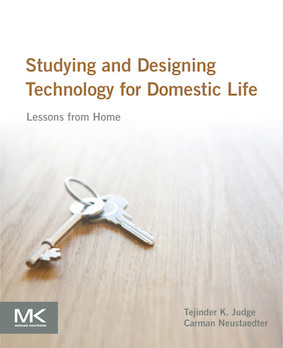 This book documents new ways in which researchers are studying domestic life, as well as designing and evaluating technology in the home. New technologies are radically changing the way that families connect with one another: we can text our teenagers from work, eat dinner with far-away parents via video link, and instantly upload and share photos after a family day out. 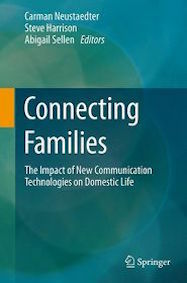 This book explores the impact of new communication systems on how families interact – how they share their lives and routines, engage in social touch, and negotiate being together or being apart – by considering a range of different family relationships that shape the nature of communication.